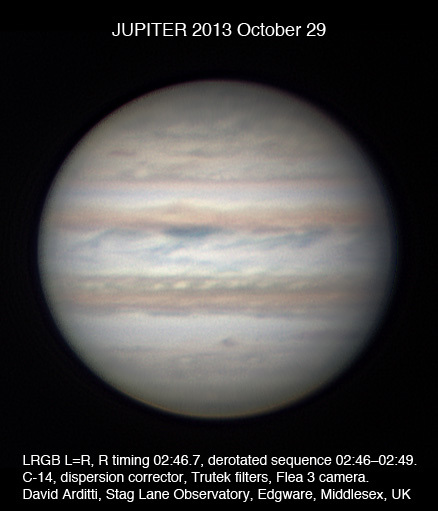 Seeing not so good as on the 10th, but as usual I’ve eked something out here using the LRGB process with L=R. Click to enlarge. 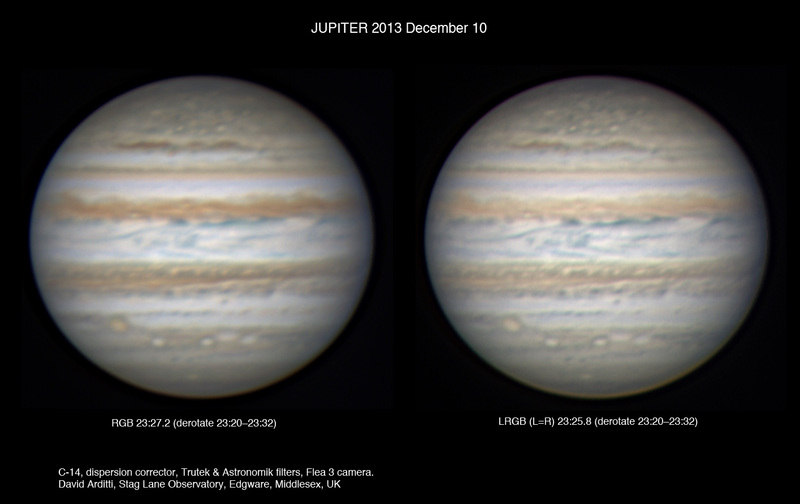 Here’s some further images from December 10, but the other end of the day. 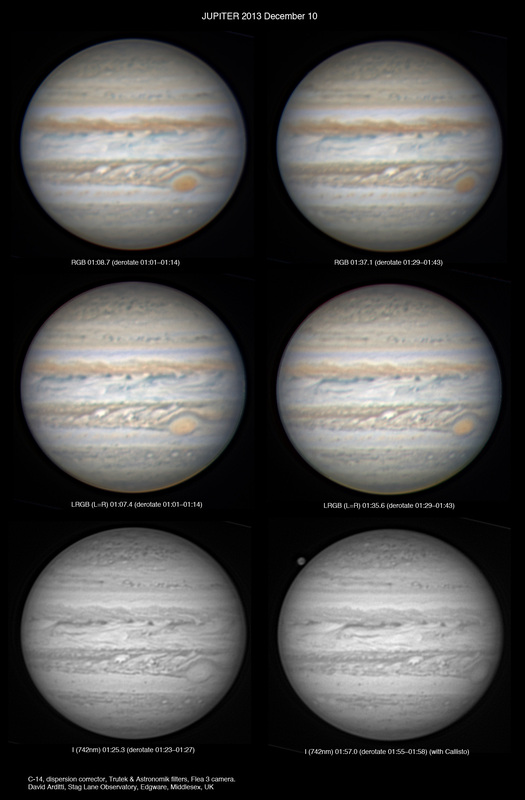 These were taken well before culmination, which was good because after midnight the sky, which had been stable for some time because of high pressure, fogged over. Click to see full size. I had a busy night; seeing was unusually good for this location. Ian Sharp reported exceptional seeing in Sussex as well, but Damian Peach, in a different part of Sussex, reported poor seeing, strangely. First row are RGB composites. Second row are the same data but presented using an LRGB process, which gives more contrasty results, but worse artefacts. 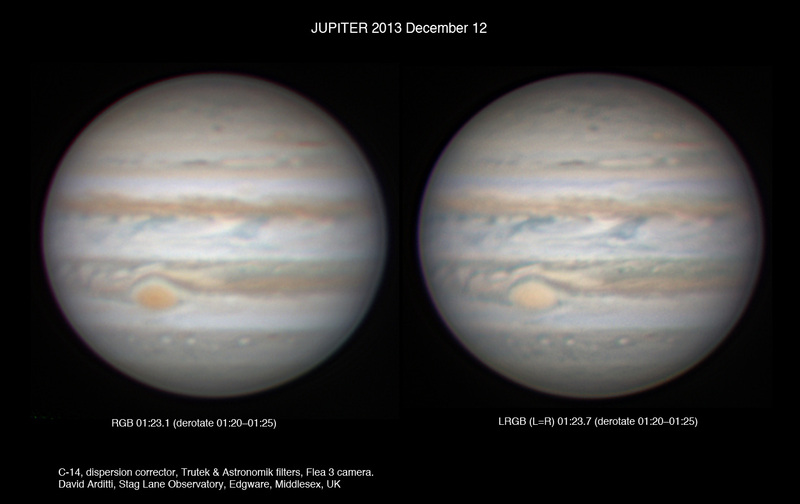 Third row are Infra-red images at 742nm, with Callisto just emerged from occultation in the second one. In total, 24 one-minute videos were processed to give this set. Click twice for full-size. A couple of images from early in the apparition. Seeing not up to much. 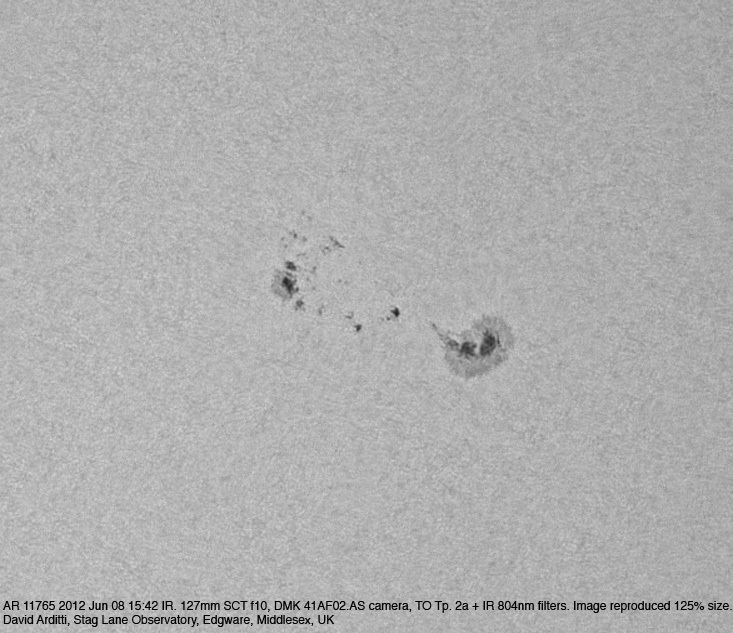 Here’s my full disk from Saturday. Seeing was not that good. 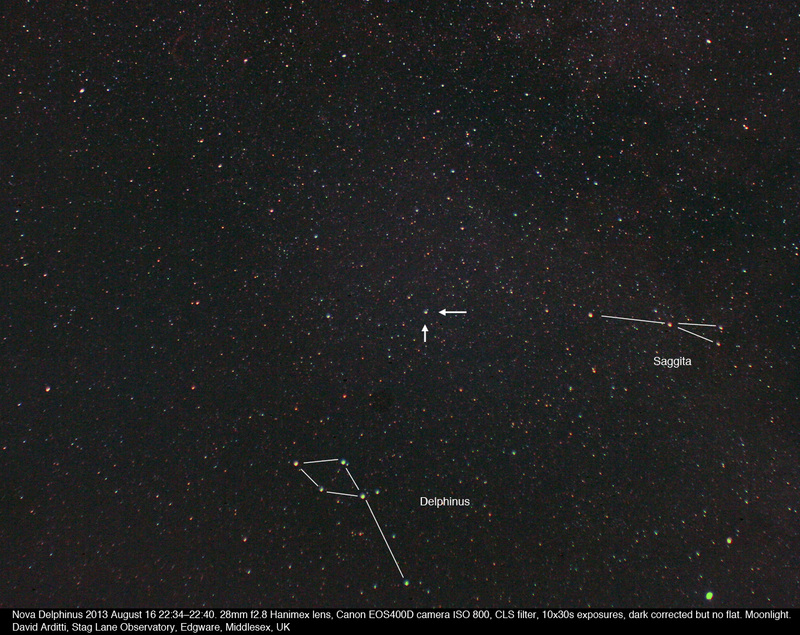 There’s a lot of scattered light. This is due to the blocking filter. 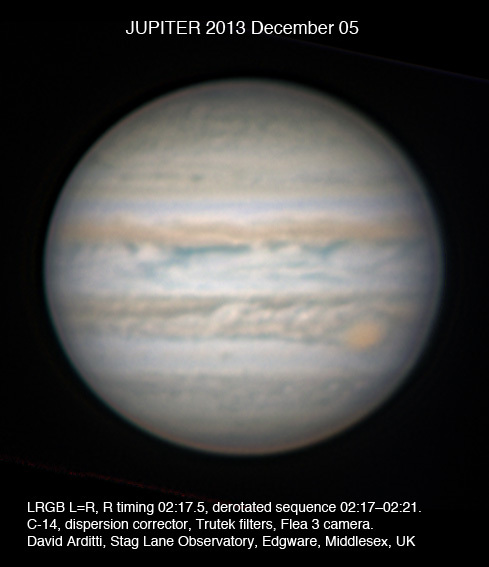 I’ve been finding that my Lunt blocking filters have gradually degraded over time, and are no longer transparent, but “crazed” on the surface of the larger glass component (the one towards the camera or eye). I wonder if anyone else has found this. 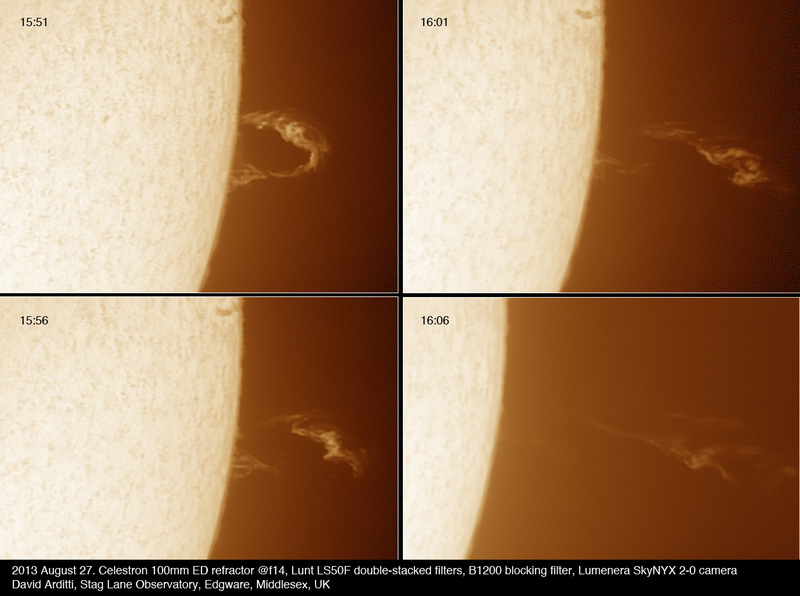 I managed to catch an astonishingly fast-moving prominence here. I imaged it for 1 minute runs at 5 minute intervals, but really this was too slow, it was changing so quickly, that shorter runs might have been better. 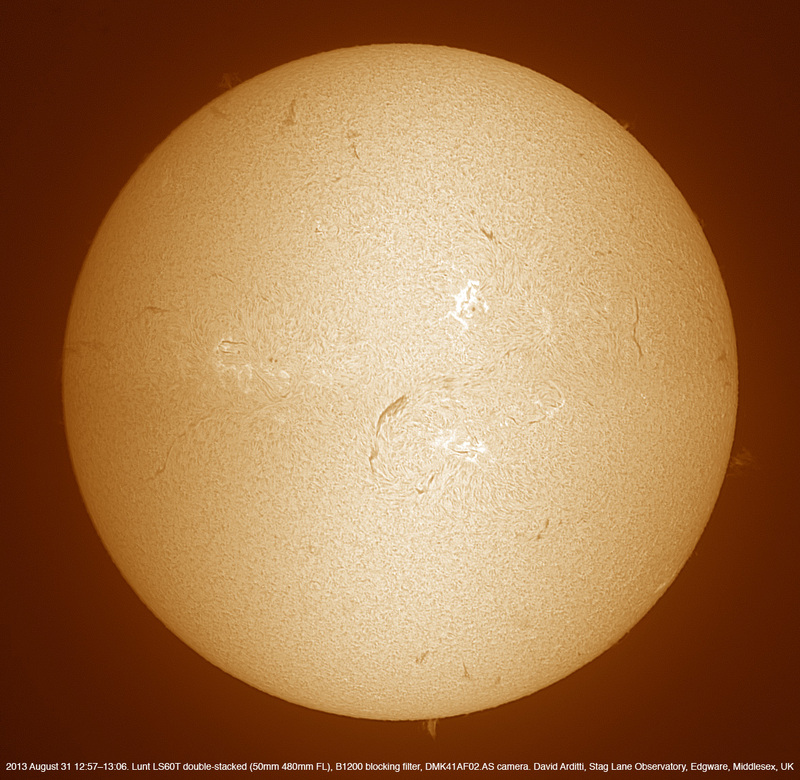 It was moving visibly on screen, and 20 minutes after I first saw it it was dissipating into space. A rough calculation shows it was travelling of the order of 10,000 miles per minute, or 0.1% the speed of light. 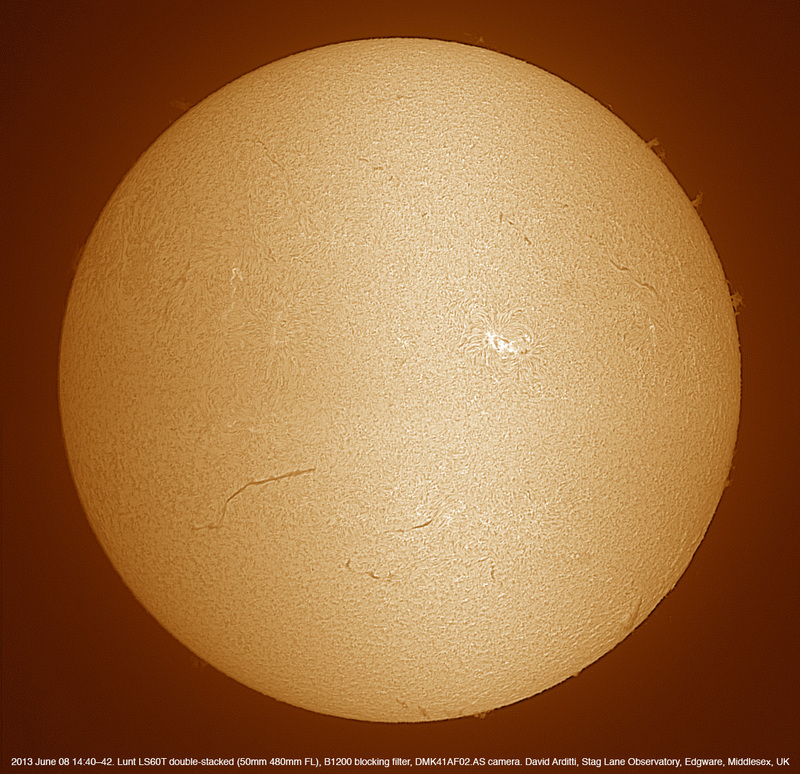 The frames are about 25% of the Sun’s diameter. 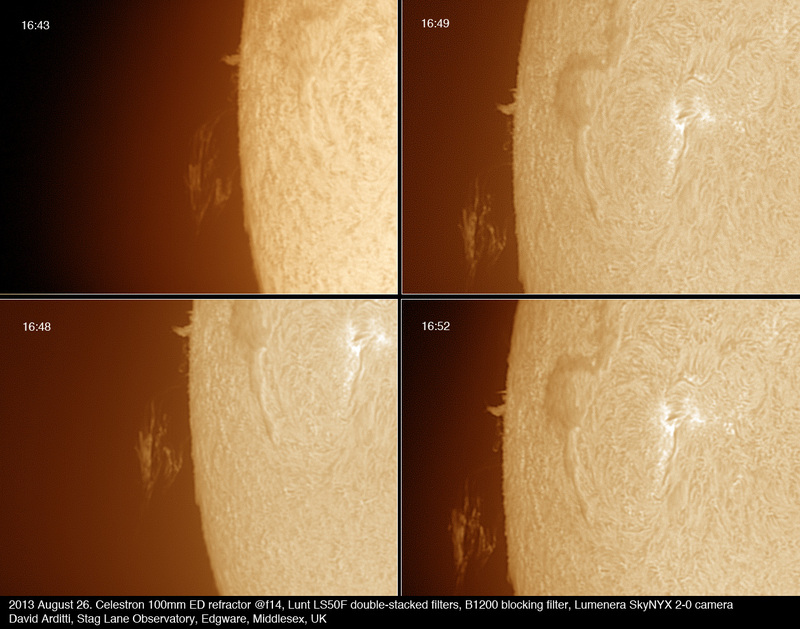 Here’s some images of a rapidly changing nearly-detached prominence on the Sun’s eastern limb. 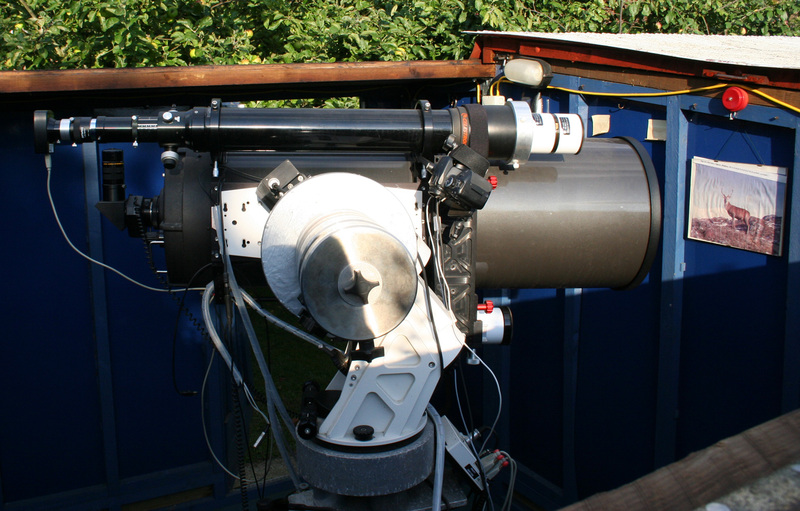 Taken with at a focal length of 1440mm with a 100mm refractor, double-stacked with Lunt 50mm filters using home-built adaptor, plus 1.6x Barlow: a nice long optical train, as shown in the photo, with the system mounted on the C-14 in Stag Lane Observatory. 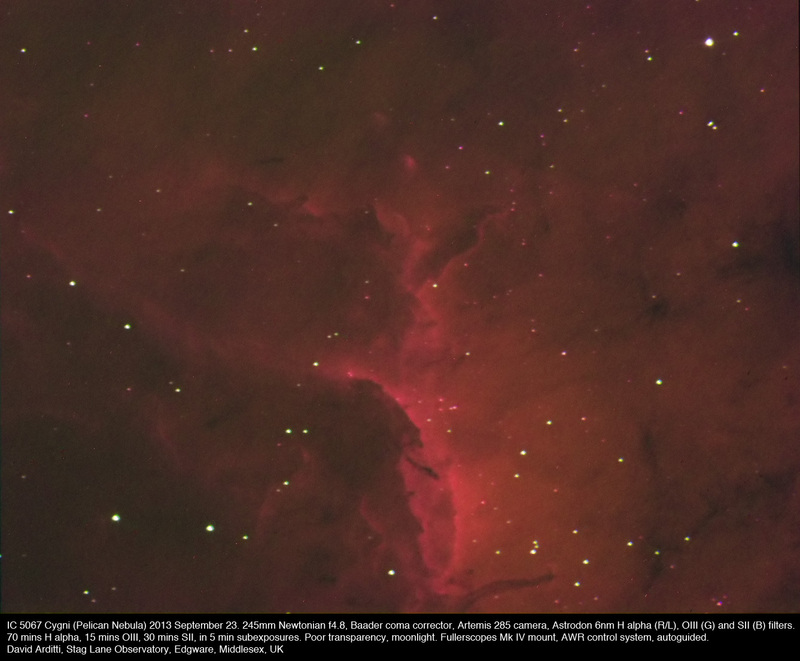 Nova Delphinus imaged with a Canon EOS 400D and old Hanimex 28mm SLR wide-angle lens. There was some interference from a gibbous Moon (Click to enlarge).